As Canada gets ready to mark 150 years of Confederation, Hockey Canada gets a new look, one that celebrates not only the game, but the Canadians who have helped make it part of the national identity. Show your support for our country and our game with the new Team Canada jersey. To commemorate the 100th anniversary of Hockey Canada, all of Canada’s national teams wore the jersey in international competition during the 2014-15 season, celebrating Hockey Canada’s heritage and history. The jersey was worn during undefeated runs to gold at the 2015 IIHF World Championship and 2015 IIHF World Junior Championship, and the black version of the jersey was worn only once, by Canada Black during the 2014 World Under-17 Hockey Challenge. Sidney Crosby wore the ‘C’ with Canada’s National Men’s Team at the 2015 IIHF World Championship, winning gold to become the 26th player – and ninth Canadian – to join the IIHF Triple Gold Club (worlds gold, Olympic gold, Stanley Cup), and the first to win all three titles as captain. Connor McDavid co-led Canada in scoring at the 2015 IIHF World Junior Championship as a 17-year-old, winning the second of his three IIHF gold medals (U18 worlds – 2013; World Juniors – 2015; worlds – 2016). Canada’s men’s and women’s Olympic teams wore the jersey at the 2014 Olympic Winter Games in Sochi, Russia, when both went undefeated to win gold – the men’s team for the second consecutive Olympics, the women’s team for the fourth. It marked the first time ever both teams went through the same Olympics without a loss. Carey Price won a gold medal with Canada’s National Junior Team at the 2007 IIHF World Junior Championship, earning Top Goaltender and tournament MVP honours. Caroline Ouellette is a four-time Olympic gold medallist and six-time world champion who wore the ‘C’ for Canada in Sochi. Canada’s National Junior Team wore the jersey just once, in a 6-0 win over Switzerland during the preliminary round of the 2010 IIHF World Junior Championship. Brandon McMillan led the way with a hat trick, while Jordan Eberle chipped in with a goal and four assists, and Jake Allen made 15 saves for the shutout. Jordan Eberle scored in every game he played with Canada’s National Junior Team, winning one gold medal and one silver (and the 2010 tournament MVP award), and is Canada’s all-time leading goal scorer at the World Juniors. Alex Pietrangelo added an Olympic gold medal to his World Juniors gold and silver, finishing atop the podium at the Sochi Games in 2014. Canada’s men’s, women’s and sledge teams wore the jersey at the 2010 Olympic Winter Games in Vancouver, B.C., when the men’s and women’s teams captivated the nation with runs gold, the second time in three Games that Canada swept Olympic hockey. The men’s gold medal game is the most-watched broadcast in Canadian television history, averaging 16.6 million viewers. Sidney Crosby was already a household name in Canada, but sealed his spot in Canadian hockey lore with the overtime winner in the Olympic gold medal game in Vancouver. Marie-Philip Poulin was the youngest player on Canada’s Women’s Olympic Team roster in Vancouver, but scored the only goals in Canada’s 2-0 gold medal game win over the U.S.
All of Canada’s national teams have worn the jersey since it debuted at the 2008 IIHF World Championship in Quebec City, Que., and Halifax, N.S., making it one of the longest-running Team Canada jerseys. Canadian teams have won nine world championships and played for gold 20 times, winning 177 of the 231 games. John Tavares won a pair of gold medals with Canada at the IIHF World Junior Championship (2008, 2009), was named MVP in 2009, and has represented his country three times at the IIHF World Championship. Billy Bridges is a three-time world champion and 2006 Paralympic gold medallist, and is the all-time leading scorer with Canada’s National Sledge Team with 340 points in 189 games. All of Canada’s national teams wore the jersey for parts of three seasons, winning medals at eight of 10 IIHF world championships, as well as an Olympic gold medal, Paralympic gold medal and IPC world championship gold medal. Canadian teams fashioned an .839 winning percentage in the jersey. Rick Nash has two Olympic gold medals, but his best Team Canada performance came at the 2007 IIHF World Championship, where he led Canada to a gold medal with an MVP performance. Todd Nicholson carried the Canadian flag into the Opening Ceremony of the 2006 Paralympic Winter Games, and then captained Canada’s National Sledge Team to its first-ever Paralympic gold medal. All of Canada’s national teams wore the jersey for parts of four seasons, including at the 2002 Olympic Winter Games in Salt Lake City, Utah, where Canada’s men’s and women’s team swept the gold medals – the first Olympic gold in 50 years for the men, and first ever for the women. In all, Canadian teams won seven world and Olympic titles in the jersey, and played for gold 13 times. Mario Lemieux captained Canada to its first Olympic gold medal in 50 years, and his play on Paul Kariya’s goal in the 2002 final – allowing Chris Pronger’s pass to go through his legs – remains one of the most iconic in Canadian Olympic history. Geraldine Heaney capped her amazing Team Canada career with Olympic gold in 2002, and was the third woman inducted into the Hockey Hall of Fame in 2013. All of Canada’s national teams wore the jersey for three seasons, including at the 1998 Olympic Winter Games in Nagano, Japan, where female hockey made its debut, and NHLers took part in the men’s tournament for the first time. Canada’s National Women’s Team was the lone Canadian team to stand atop the podium in the jersey, winning three consecutive world championships from 1999-2001. A four-time Stanley Cup champion, Patrick Roy made just one Team Canada appearance during his illustrious career, at the 1998 Olympics, and was inducted into the Hockey Hall of Fame in 2006. Manon Rhéaume was a two-time world champion, and remains the only woman to participate in an NHL exhibition game, for the Tampa Bay Lightning in 1992 and 1993. 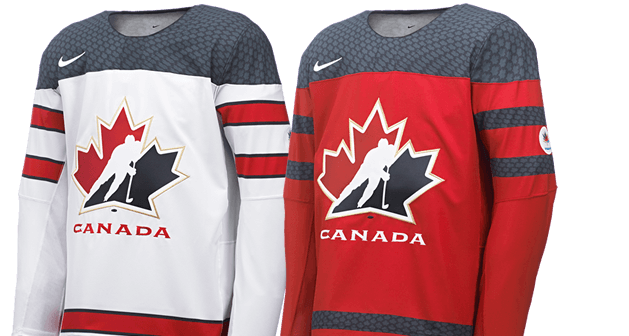 Canada’s national teams wore the jersey for parts of three seasons, including its second Triple Gold season in four years in 1996-97 – Canada took home the gold medal at the IIHF World Championship, IIHF World Women’s Championship and IIHF World Junior Championship. Canadian teams played for gold at five of the six international events the jersey was worn at, winning four. Joe Thornton won a gold medal at every level of the Program of Excellence – under-17, under-18 and under-20 – in a 12-month span, capped with gold at the 1997 IIHF World Junior Championship. France St-Louis was a gold medallist with Team Canada at the first five world championships, and was invested into the Order of Hockey in Canada in 2014. All of Canada’s national teams wore the jersey during the 1993-94 season, and it will go down as one of the most successful in Hockey Canada history. Canada swept the IIHF World Championship (winning gold for the first time in 33 years), IIHF World Women’s Championship and IIHF World Junior Championship, becoming the first, and still only, country to win all three in the same season. Luc Robitaille is the highest-scoring left winger in NHL history, recording 1,394 points in 1,431 games, and wore the ‘C’ as Canadian captain at the 1994 world championship. Hayley Wickenheiser is the all-time leading scorer in international women’s hockey, and made her Team Canada debut as a 15-year-old at the 1997 world championship. Canada’s National Women’s Team wore the jersey at the inaugural IIHF World Women’s Championship when the tournament debuted in 1990. It was ‘Pink Power’ in Ottawa; spurred on by the unique Team Canada jerseys, fans at the Ottawa Civic Centre were decked out in pink, and even the Zamboni driver got into the act. It worked – Canada won the first women’s world title. Angela James’s 11 goals in 1990 remain the most ever by a Canadian at a single world championship, and she was one of the first two women inducted into the Hockey Hall of Fame in 2010. Cathy Phillips was named Top Goaltender in the COWHL 14 times in 17 years before her career was ended by a brain tumour just two months after the 1990 world championship. Canada’s National Men’s Team wore the jersey, or a variation of it, at the Canada Cup, the first best-on-best international tournament. Of the five tournaments held, Canada hoisted the trophy at four of them, thanks to some of the most memorable Team Canada moments ever, including Darryl Sittler’s overtime winner in the 1976 final, or the Gretzky-to-Lemieux goal that clinched the 1987 title. Wayne Gretzky is, quite simply, The Great One, representing Canada at four Canada Cups, leading the tournament in scoring three times and winning MVP honours in 1987, when he had 21 points in nine games. Bobby Orr showed why he is considered the greatest defenceman of all time, recording nine points in seven games and taking home the MVP award in 1976. The Program of Excellence was created in the lead up to the 1982 IIHF World Junior Championship, and it paid immediate dividends. Canada beat the perennial favourite Soviet Union for the first time – a 7-0 thrashing – en route to its first-ever gold medal. When Canada clinched gold in Rochester, Minn., there was no recording of ‘O Canada,’ so the players sang the anthem themselves, beginning a tradition that continues today. Gord Kluzak was named Top Defenceman at the 1982 IIHF World Junior Championship, six months before he was selected first overall by the Boston Bruins in the NHL Entry Draft. Marc Habscheid was head coach of Canada’s National Junior Team at the 2003 World Juniors, becoming the first to coach the team after playing for it. Canada’s first National Men’s Team was created leading into the 1963-64 season, culminating in the 1964 Olympic Winter Games, and wore the jersey for its first two years of existence. Canada finished fourth at the 1964 Olympics and 1965 IIHF World Championship, although the 1964 finish will forever be a controversial one. Terry O’Malley ranks fourth in all-time games played for Canada at the Olympics (19), wearing red and white in 1964, 1968 and 1980, and was inducted into the IIHF Hall of Fame in 1998. Eight years after representing Canada at the Olympics, Rod Seiling appeared in three games during the 1972 Summit Series. Seth Martin won gold at the 1961 IIHF World Championship with the Trail Smoke Eaters, was a four-time Top Goaltender recipient at the worlds (1961, 1963, 1966) and Olympics (1964), and was a 1997 inductee into the IIHF Hall of Fame. The Edmonton Mercurys wore the jersey in Oslo, Norway, when they became the sixth and final club team to win in an Olympic gold medal for Canada. Needing only a tie in their round robin finale against the U.S. to clinch the gold medal, Canada got just that; a 3-3 draw gave the Canadians gold, while the Americans were left with silver. Five players – John Davies, Billy Dawe, Don Gauf, Al Purvis and Bob Watt – won Olympic gold two years after helping the Mercurys win the gold medal at the 1950 IIHF World Championship in London, England. The RCAF Flyers wore the jersey when they returned Canada to the top of the Olympic hockey podium after a 16-year absence (silver in 1936, no Olympics in 1940 and 1944 due to WWII). The Flyers actually finished tied with Czechoslovakia at 7-0-1, but won the gold medal on goal differential (+64 for Canada, +62 for Czechoslovakia). George Mara served as a director of Maple Leaf Gardens from 1957-69, and briefly served as president in 1969. The entire RCAF team was honoured by the Canadian Forces in 2011 as Canada’s greatest military athletes of the 20th century. The Winnipeg Hockey Club wore the jersey when they made it four-for-four in Olympic gold medals for Canada in Lake Placid, N.Y.; a tie with the host United States on the final day of the double round robin format was enough to give Canada gold and leave the Americans with the silver medal. Vic Lundquist not only won Olympic gold, he won an IIHF World Championship gold medal in 1935, and coached Sweden at the 1936 Olympic Winter Games. Walter Monson was inducted into the British Ice Hockey Hall of Fame in 1955. The University of Toronto Grads wore the jersey when they claimed Canada’s third consecutive Olympic hockey gold medal in St. Moritz, Switzerland, not allowing a single goal in three games and reaching double digits in all three. The Canadians were so dominant, they were given a bye directly into the medal round. Conn Smythe (coach) was the principal owner of the Toronto Maple Leafs from 1927 to 1961, built Maple Leaf Gardens, and was inducted into the Hockey Hall of Fame in 1958. Joe Sullivan served in the Senate of Canada as a Progressive Conservative from 1957-85, and the Senator Joseph A. Sullivan Trophy is presented to the CIS men’s hockey player of the year. The 1923 Allan Cup champion Toronto Granites wore the jersey when they claimed Olympic gold in Chamonix, France. The Granites were arguably the most dominant Olympic gold medallists ever, outscoring its opposition 110-3 in five games, including single-game goal totals of 19, 22, 30 and 33. Hooley Smith played 17 NHL seasons, winning a pair of Stanley Cup championships (Ottawa Senators, 1927, and Montreal Maroons, 1935), and was inducted into the Hockey Hall of Fame in 1972. Harry Watson scored a record-setting 36 goals in five games at the 1924 Olympics, including 13 in one game vs. Switzerland, and was inducted into the Hockey Hall of Fame in 1963. The original Team Canada jersey, it was worn by the 1920 Allan Cup champion Winnipeg Falcons when they represented Canada at the 1920 Olympic Summer Games, the first to include hockey. The iconic mustard-yellow jersey returned in 2004 when Canada wore a version of the Falcons’ jersey during the World Cup of Hockey. W.A. Hewitt (coach) was inducted into the Hockey Hall of Fame in 1947, and was the father of Hockey Hall of Fame broadcaster Foster Hewitt. Frank Frederickson was one of the first players to win an Olympic gold medal and a Stanley Cup (Victoria, 1925), and was inducted into the Hockey Hall of Fame in 1958.